Amber Guffey does things with a basketball that would make Criss Angel say, "Wow!" Not blessed with great speed or leaping ability, Guffey tortures opponents with deadly long range jump shots, a killer cross-over dribble, the ability to create a shot in any circumstance, and near perfection from the charity stripe. Watching her play is like watching a basketball game and a magic act all rolled into one as she uses creativity and audacity in equal measure to befuddle opponents. Defenders are often tempted to crowd her on the perimeter but when they do that she uses her lightning quick cross-over to explode past them for a layup. If she encounters a taller defender she'll find some way to flip the ball into the basket and draw contact in the process. Give her room and she'll bombard you with three-pointers. After last year's Ohio Valley Conference tournament final Eastern Illinois head coach Brady Sallee said: "We didn't expect Amber Guffey to make shots from the concession stand." But she isn't just a scorer, she creates opportunities for her teammates and makes those around her better. Earlier this season Guffey found herself triple teamed as she crossed mid-court against Bethel. Trapped against the timeline by taller players it looked like she would have to call timeout. Instead, she stole a glance at the basket, then turned her back and threw the ball backward over her head to a teammate for a layup. Over the last three years Guffey has rewritten the record book at Murray State. She is currently ninth on the all-time scoring list and if she continues to score at her current pace she could be as high as second by the end of the season. She is already the career leader in three-point field goals and she’s second in three-point field goal percentage. She holds the record for most free throws made in a season and is the career leader in free throw percentage. She is also the career leader in assists. "I would trust Amber at the free throw line before anyone else in the country. If my house or my job was on the line and I had to have one person shoot a free throw it would be Amber Guffey. Her work ethic is unsurpassed and she is reaping the reward for all the work she's put into the game." Of course Murray State has also done a lot for Guffey. "There are a handful of people who have come here over the years who have changed dramatically while they were here and she's one of them," Cross said. "She's much more outgoing than she used to be and it's much easier for her to talk to the press. "When she was a freshman she would look away or look down but now she'll look you in the eye. And she's become a leader too. She doesn't hesitate to tell her teammates what they need to do." 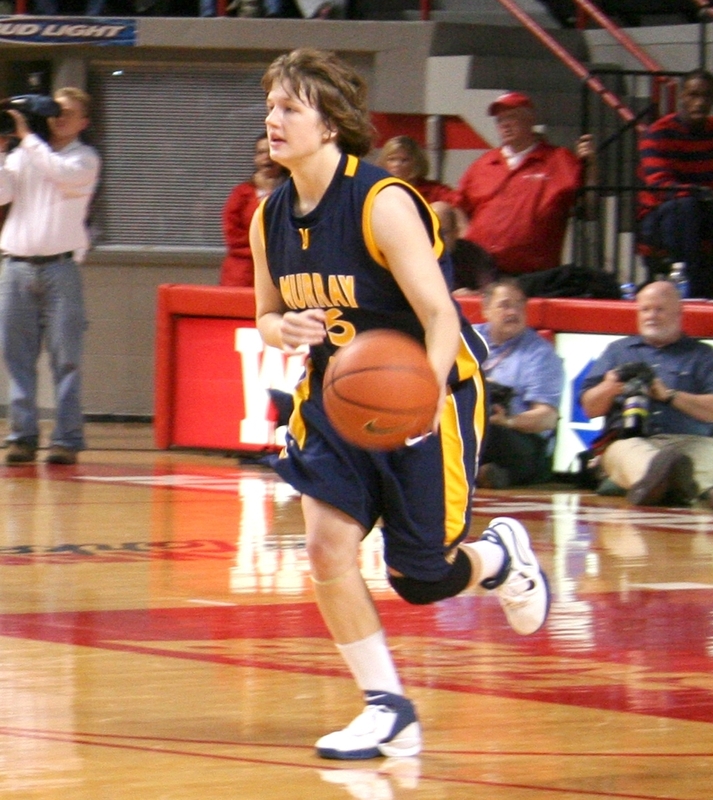 Guffey grew up in Albany, Kentucky where she starred for Clinton County High School. Her list of accomplishments while at Clinton County is about as long as an income tax return. As a senior she set the single season state record for assists. She is also fourth, sixth and ninth on that list and she is second in career assists. She is third and seventh in single season free throw percentage and is eighth and ninth in consecutive free throws made with strings of 30 and 31. She is third in career free throws made.